Advocacy is more than just aligning yourself with a cause-it is making an impact on the lives of those that need it the most. Miguel A. Dominguez is an Associate Attorney in the Litigation Section of Thomas Kennedy Sampson & Tompkins LLP. His principal areas of practice include personal injury, wrongful death, negligent security, premises liability, medical malpractice, insurance defense, and civil rights litigation. Growing up in the Bronx, New York, Mr. Dominguez developed a keen perception of the systemic cycles that prevent communities from enjoying a safe and healthy environment in which to prosper and raise children, and this lead to his decision to be a part of the solution. Fueled by both his past experiences and his desire to incite progression, Mr. Dominguez rose from his circumstances attending the State University of New York at Buffalo and graduating with a degree in Psychology. Prior to entering the legal field, he worked as a mental health professional providing case management services for homeless and mentally ill clients here in Atlanta. Driven by his passion to right the wrongs, to empower, and to seek justice for those whose voices are often quieted by class lines, he worked tirelessly to position himself to become the voice of the voiceless; receiving his Juris Doctorate from Western Michigan University’s Cooley Law School in Lansing, Michigan. Mr. Dominguez began his legal career as a law clerk for the Honorable Anne Elizabeth Barnes of the Georgia Court of Appeals. Later, he briefly practiced law as a solo practitioner in the area of criminal defense, before leaving his practice to represent the State of Georgia as a prosecutor. As a prosecutor, Mr. Dominguez acquired significant jury trial experience. Despite his tremendous success trying cases and his reputation for being tough on those showing a pattern of terrorizing the community, he simultaneously acquired a reputation for being a conscientious prosecutor, discerning in creating opportunities for those in need of a second chance. His work as a prosecutor spans several metro Atlanta communities including the Rockdale County District Attorney’s Office, the Office of the DeKalb Solicitor-General, and the Clayton County District Attorney’s Office where he investigated and prosecuted a wide variety of felonies, from bank and insurance fraud to armed robberies, rapes, and homicides. As a Caribbean-American, Mr. Dominguez became the first Latino prosecutor in the history of the Rockdale, Stone Mountain, and Clayton Judicial Circuits. As a civil litigator, Mr. Dominguez defends his corporate clients against fraudulent personal injury claims totaling millions of dollars. However, Mr. Dominguez is also a Plaintiff’s attorney, specializing in wrongful death and negligent security actions. Mr. Dominguez fights on behalf of the victims of violent crime, whose family members have been seriously injured or killed by criminals at motels and apartment complexes in crime ridden neighborhoods. Mr. Dominguez is an absolute game-changer in the courtroom, but he is equally as fierce out in the community. He is the current President of the DeKalb Lawyers Association. He has been appointed to serve on the State Bar of Georgia’s Committee to Promote Inclusion in the Profession. Mr. Dominguez has also been selected to serve as local counsel by the Mexican-American Legal Defense and Education Fund’s national litigation team, challenging discriminatory practices affecting the rights of over 20,000 Latino college students in the State of Georgia. 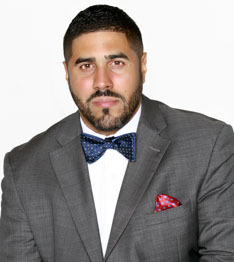 Additionally, Mr. Dominguez volunteers his time and his experience as a prosecutor to give back to the community, as a pro bono attorney for the Georgia Justice Project (GJP). As a volunteer lawyer with GJP, he provides legal services for indigent, youthful offenders who receive a second chance at becoming a productive and successful member of society by way of having their criminal records restricted. Miguel is wholeheartedly committed to lifting up and encouraging today’s youth, so much so, that he is frequently asked to speak at youth detention centers and schools in Georgia, Michigan, and New York, sharing his experiences as an at-risk youth, lawyer, leader, and father and challenging young people to dream well beyond their immediate circumstances. Above all else, Miguel is a family man. Though his dedication to his work and community demand very long hours, his top priority is to his wife and children.